The 40 S&W has gained in popularity over the years, and is commonly thought of as a balance between the 9mm and 45 ACP. This is because the 40 S&W is faster than the 45 auto, and heavier than the 9mm. 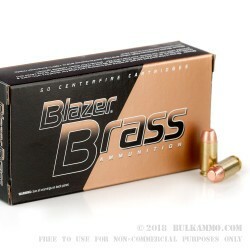 This Blazer Brass ammunition in 40 S&W is loaded with a 180 grain full metal jacket bullet, which is perfect for range training, but should not be used for self defense. 180 grain bullets are a heavy but common weight for 40 S&W, and are a great bullet weight for full size handguns, and will result in moderate recoil in small pistols. This is the worst ammo I've ever fired. Awesome product + Great Price! Shot 1000 rounds of .40 s&w 180 gr fmjfp by blazer brass out of my 3rd Gen Glock 22 with zero problems. 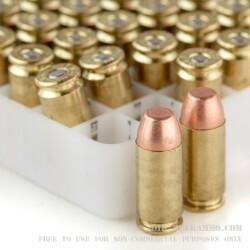 Ammunition seems to be top notch and at a very reasonable price. Just bought 2 more cases from Bulk ammo. Works Great - Bulk Ammo always does the job. overall a good experience. slight delay with shipping. people are good to work with. 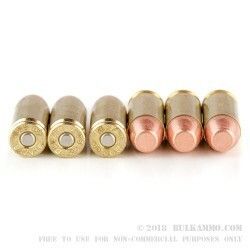 Q: Are these ok for a range that doesn't allow steel jacket,steel core,tracer or armor pericng bullets? No steel aloud at this range. A: Hello Dan, This ammunition is loaded with a lead core, copper plated projectile and does not contain any steel. 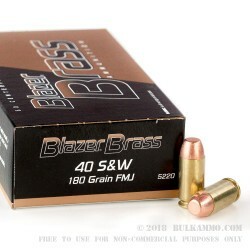 A: These 40 S&W rounds are factory new loads from Blazer. All components used are non corrosive. The brass is boxer primed for reloading if desired.